by both families involved in their daily care. We are not a broker or pet store. We do not find homes for other breeders' puppies. We have been raising our own quality puppies since 1993. Hello Everyone!! Welcome to our puppy site. 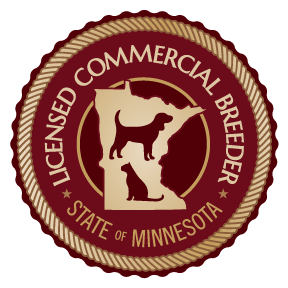 We are located 20 minutes north of Albert Lea, Minnesota and have been breeding since 1993. We are devoted to the quality care and health of each and every puppy. We believe that a clean, relaxed environment, not to mention lots of love and attention, are essential to the well being of our dogs and puppies. You are welcome to view adult pictures of puppies purchased here under the PAST PUPPIES links. All purebred puppies are registered with America's Pet Registry, Inc.
All of our dogs have wonderful dispositions and are carefully bred to ensure that they are happy, healthy, and free of genetic defects. We strive to breed the very best puppy we can. Our puppies are vaccinated and de-wormed before going to their new homes. They each get a kennel cough vaccine at six weeks of age, five way puppy vaccine at six, nine and twelve weeks of age, and de-wormed at two, four, six, nine and twelve weeks of age. Each puppy comes with a one year written congenital health guarantee and a puppy wellness check up. We also offer a wonderful service of Micro-chipping, please let us know if this is of interest to you, please check our Frequently Asked Question page to find out why you should Microchip. 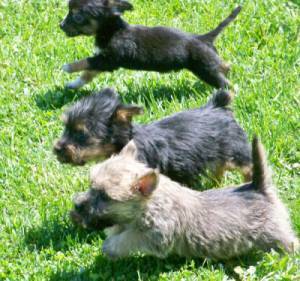 Sale pricing is not valid on previously purchased puppies! Puppies by Possehl reserves the right to refuse to sell to any person or persons for any reason, we take great pride in finding the best homes for our puppies! !